Peshawar: Khyber Agency Agriculture department successfully cultivated saffron in the area where cannabis farming was common with the aim to produce a substitute of the previous crop in local area with the world most expensive spice. Three million was allocated to bring the gold bulbs from Chitral in PC-1 with the aim to produce stigmas and bulbs, deliver them to the market, which will help in growing the future economy of Federally Administered Tribal Areas (FATA). From among its seven agencies, Khyber Agency is the most famous one in FATA with a unique historical background and geographical location. The 2,576 square kilometers area of the Agency is located in the north of Pakistan. Its climate has extreme temperatures, with cold winters and warm dry summers. According to the FATA Development Statistics Bureau around 49000 acre areas are cultivated in Khyber Agency with cannabis as the most popular cop. In the beginning, the measure was initiated by an Agency officer with the support of the law enforcement representatives and political agent of the Khyber Agency under the regional development programme to produce a substitute in the market. While the KP agriculture department was not supportive during the initial research, the agency officer started test research on his own in Tirah Valley in Sep 2016. He used the initial lot of gold bulbs from Chitral and cultivated over a 5 Kanals of saffron plots in different areas of Maidan valley spending approximately 1.5 million rupees. In the initial pilot phase sixteen different farming lands were used for saffron cultivation and these farmer received training from agriculture department on bulbs farming. Saffron is the world’s most expensive spice. This perennial carries narrow ribbed leaves and is grown from blubs known as corm. The saffron spice is derived from stigmas of the saffron crocus, which is opulent rust to red coloured. It is a valued condiment, commonly used in cuisine of different countries. Saffron grows well in areas that have cold winters and warm dry summers. After the successful experiment of saffron cultivation in Khyber agency, bearing outstanding results, more expectations are now focused on its harvest. An agency officer from the Khyber Agency agriculture department, Shamas-u-Rehman Khattak, told Truth Tracker that although the task presented a big challenge for them, the first and vital challenge was the availability and acquisition of healthy bulbs. This was, however, managed by bringing gold bulbs from Chitral. He, however, alluded to the restrictions in policies and security concerns, which is debilitating the progress of any initiative. Since the production of saffron across the country is limited, if not rare, the cultivation of saffron plants in Khyber Agency’s various locations promises an increase in the production of stigmas and bulbs for the local market and an opportunity to promote saffron farming in other parts of country. This way people would get fresh quality real stigmas from a nearby place since the freshly produced saffron are best for use during first six months after harvesting, any later and the stigmas lose their real fragrance and quality. Fields for Saffron Cultivation are being prepared : Photo by News Lens Pakistan. As the initiative is still undergoing its testing phases, efforts are being made to increase size of bulbs and grow the quantity of bulbs. The healthy bulbs size, weighing more than 25grams, can bloom more than four flowers depending on climate and soil fertility. After successful experimental test of saffron cultivation, the agriculture department Khyber agency has permission of security agencies to bring synthetic fertilizer for farming bulbs. 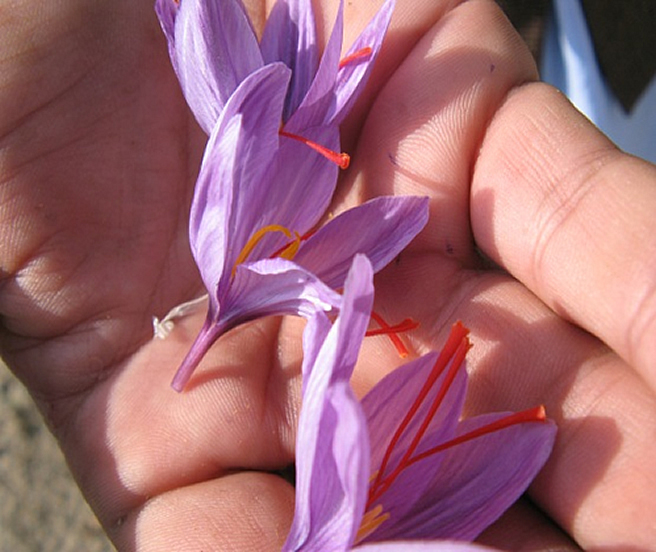 The normal time for saffron cultivation begins in September and the flowers bloom mid-October through mid-November. “As it is a one-time investment, the bulbs can be re-used for cultivation for another 5 to 10 years as the older bulbs can bloom more flowers than fresh ones” says Khattak. Cultivation of saffron is not a common for local farmers so they require more training opportunities to become fully aware of well forming of bulbs. 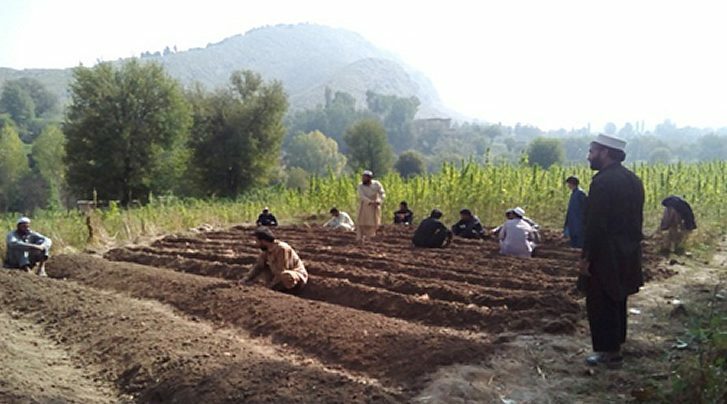 “Convincing and training of local former was a challenge for us as they were thinking that the plant would grow like a big tree” says agriculture officer Khyber Agency, Faiq Iqbal. On an average, 10g of saffron can make Rs.6000 to Rs.10000 in the local market this means that per Kg can farmers can make Rs. 200,000 to Rs. 300,000 accordingly. According to the management practice the yield of dried saffron from 2 to 6 kg per hectare can be possible. But the cost of purchasing seeds and bulbs are very expensive and initially 80,000 to 90,000 saffron corms are required for one acre, which is a steep investment for the local farmer. A local farmer dubbed saffron farming opportunity as a great chance for us to cultivate the crop for the first time under the guidance and support of the agriculture department. He hoped this would provide more business opportunities for farmers in the future. Khattak said that production of more and quality stigmas require training and supports from the countries already producing saffron, and added that investors are welcome to come and invest in crop. The production of saffron will not only fulfill the local market’s need but could boost the economy of FATA. This is not the first time that FATA plays a role in contribution to the national economy. Last year saw the production of wheat increase from 36% to 44% of the whole country’s production. Not only this but in the previous year, during the World Food Day organized by World Health Organization, from a congregation of all farmer associations from across the country, FATA farmers were nominated in top four pitches where KP and Punjab didn’t even make the list. Currently, FATA has some restrictions in its different policies, which need to be revised. Such a provision would provide opportunities to the people of FATA to produce more quality products for the local and national markets.